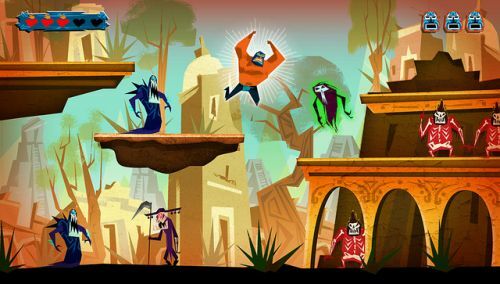 We haven't heard much about Guacamelee! since we saw it last fall at PAX Prime. The metroidvania style game where you take control of mutli-dimensional hopping luchadors and do what luchadors do - beat things up - is coming out next month on April 9th. Slated for the PlayStation Vita and PlayStation 3, Guacamalee! will set you back $15 with full cross-buy support, that means you buy it once and you get it on both platforms. The game also supports an interesting use of the Vita by allowing you to control the PlayStation 3 version with the Vita and give you some extra goodies on the screen. There's full two player local co-op support through the entire campaign and from what we played of it at PAX it's an absolute blast. Also chickens.